The Filled Spandrel Wall Arch consists of a vertically curved concrete slab with vertical walls (spandrels) cast on top of the slab to form the sides of the bridge. The area between the walls and top of the arch was filled with granular material and the roadbed was placed directly on the fill. These types of arches have functioned quite well through the years with minimal maintenance. Some of the problems associated with this type of bridge include the entrapment of moisture in the fill, which in turn can deteriorate the spandrel walls. In some cases, the walls start to lean outward due to the weight of the saturated fill. This opens up cracks in the wearing surface along the edges, which allows more moisture into the fill and the failure is exponentially progressive. In some arches, in urban areas especially, sewer and water lines were buried in the fill; these lines can eventually settle and break open, allowing water to leak into the fill material. Keep wearing surface (usually asphalt) crack sealed. Keep gutter areas (especially where they abut the spandrel walls) sealed with a flexible sealer such as rubberized asphalt. If utilities are buried in the fill (such as storm sewer and/or water lines) check to make sure they are not leaking into the fill material. If there is evidence of moisture collecting in the fill, consider installing drains at the low points of the arch by core drilling through concrete into the fill material. The Open Spandrel Arch also has a vertically curved concrete slab, but instead of solid spandrel walls, it has vertical columns supporting floorbeams and a deck slab, usually all constructed of concrete. Alternately, the bridge may be constructed of individual arch ribs that support the vertical columns. The area on top of the arch and under the deck is open and thus can be inspected easily for damage. 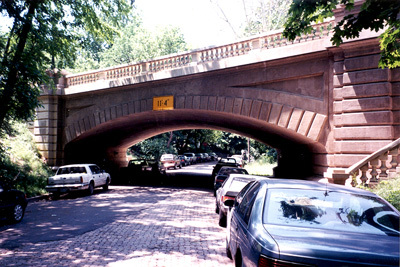 The most common problem associated with this type of bridge is leakage at joints (on multiple span arches), or drainage from scuppers dropping directly onto the arch components. Keep the deck surface sealed as discussed under Concrete Decks. Clean areas under expansion joints annually by flushing and sealing the surfaces affected. Redirect drainage from scuppers that falls directly onto arch components, or extend scuppers with plastic tubing so that drainage falls directly to the ground. The Through Arch (or rainbow arch) usually consists of two arch ribs that extend well above the roadway on each side of the bridge. The roadway passes between the arch ribs. Vertical columns are attached to the underside of the arch ribs at regular spaces. The verticals hold up transverse floorbeams which in turn support the deck slab. 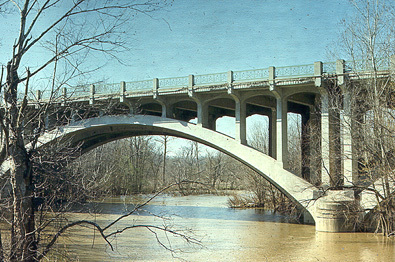 Most Through Arches in Ohio are constructed of reinforced concrete, but a few are constructed of steel. This Manual will only discuss concrete ones, since they are most prevalent. The most common problems associated with this type of arch are due to salt spray and leaking joints. Concrete is a very good building material as long as it is kept in compression, but with this type of bridge, the verticals are tension members. They are reinforced, but due to their slenderness, there is not much room for the reinforcing steel and the amount of concrete cover is critical. Since the majority of these types of bridges were built before the advent of epoxy-coated reinforcing steel, the vertical columns are especially prone to salt spray and the resultant corrosion of the reinforcing steel. 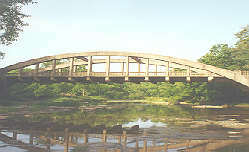 These types of bridges were also commonly constructed with contraction joints near each end of the deck slab. These joints, which allowed for some rotation of the deck slab, were typically located directly above the edge of the second floorbeam from each end. The resultant leakage usually deteriorated these next-to-the-last floorbeams. As a result of these details, it is imperative to keep the top side clean and to seal all components within the splash zone. Power wash the deck surface, gutters and vertical columns annually. Keep the wearing surface sealed as discussed under Concrete Decks. Seal all components of the arch within the splash zone with silane/siloxane or epoxy/urethane. Identify the transverse contraction joints in the deck near each end and crack seal with rubberized asphalt, silicone caulk, or urethane caulk.